How busy we can become . . . and as a result, how empty! We mouth words, but they mean nothing. We find ourselves trafficking in unlived truths. We fake spirituality. How easy to fall prey to meaningless talk, cliché-ridden responses, and mindless activities! It was never meant to be that way; but, more often than not, that's the way it is. Let’s explore some reasons for our disbelief. First, faith usually defies human reasoning. For example, when we are in financial difficulty, logic says to save every penny, whereas God says He will bless the generous giver. Second, feelings of fear, inadequacy, or guilt can interfere with trusting biblical truth. Third, we often focus on the circumstance rather than our heavenly Father. He is at work, yet we fail to notice His hand. And finally, uncertainty about God’s will can lead us to doubt Him. Edmund Burke wrote, “All that is necessary for evil to triumph is for good men to do nothing.” When it comes to the political scene and government, there are some who have dropped out all together. They have the idea that if you get involved in government, somehow that is the “social gospel.” So they’ve just hunkered down, trying to “hold on till Jesus gets here.” They see the political scene as being dirty and worldly. And some have been intimidated by the great debate between church and state. We can’t drop out. It’s impossible to think that God would have ordained government and told His people to stay out. Who else does that leave to run things? Others with misguided zeal have tried to bring in the kingdom of God by political machinations. That cannot be done either. So where do we get the answers? We’re not going to get the answers today from the politician who may have his personal ax to grind or from the ungodly and the humanists who don’t believe the Word of God, or from finger-bumping philosophers who don’t know the Word of God. The only place we’re going to get the answers, I believe, is from the Word of God. We need to confess and turn from our wicked ways. We need to speak up and stand up for what is right. Let your speech be seasoned with salt. But stand u-p, speak up and come out from under the rock. Stand on the rock and speak up for the Lord Jesus Christ. That's a really good question—and it's an important question, because it's about life and death issues. And if God doesn't exist, then Christianity totally falls down. Some things that I've thought about that prove the existence of God: firstly, creation. When I look at creation, when you look around at the beauty of nature, you think it's so beautiful it's like a painting, a masterpiece—and so it makes me feel that there must be a master behind it, a master artist, a master designer. And so that's one of the reasons that makes me think God exists—but I appreciate that not everyone looks at nature and sees a Creator behind it. Another evidence for God is that we all have a conscience. We all know right from wrong: where do we get that from? That's God. And a bigger proof is the man Jesus Christ. He lived and he died and he rose again—and he claimed to be God. And if that's true—if he is who he claimed to be—then obviously that proves. While this passage is talking about saving faith, the principle is no less true for the faith needed in your daily Christian walk. So if you want your friend to trust in Christ for salvation, open your Bible as you talk to them about Jesus; show them the passages you’re talking about. Want to grow in your faith as a believer? 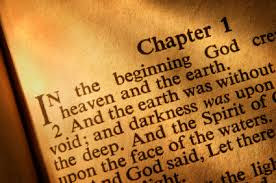 Open your Bible and read it yourself. God’s self-revelation in the Bible will increase your faith! As someone once said, “If we are not interested in the word of God, can we really be interested in God?” It’s in His word that you’ll see the greatness of who He is. His unbelievable power will become a part of how you weigh the difficulties of life. His grace toward the worst of sinners will give you confidence to approach Him when you have sinned. His kindness will lead you to repentance. His wisdom will cause you to trust Him even when you can’t understand what He is doing. His love will move you to commit yourself in love to Him. Making and keeping our commitments gives others confidence in us, but more importantly, it gives us confidence in ourselves. It allows us to grow beyond our current limitations, and it helps us navigate through temptations and other spiritual pitfalls. While many people mistakenly think that making a commitment will box them in and keep them from doing other things, the truth is quite the opposite. It’s only when we can give our word and keep it that we have the ability to move and to grow exponentially. Anything worth anything in this life requires commitment. Marriage, children, careers, spirituality – you name it – all require us to be able to give our word and keep it. The more we keep our word, the more powerful our word becomes. God’s reminding us today that He’s given us a great ally in our spiritual life: His word. Build your life on His word and watch your faith grow.